UMASH is fortunate to partner with Extension colleagues across the state in a number of areas. 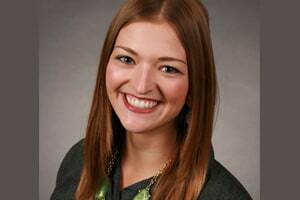 One colleague is Emily Wilmes, Extension Educator in Stearns, Benton and Morrison Counties. Emily has a passion for farm safety and has been an integral part of UMASH’s efforts. She completed her Master’s degree in 2017 with her research directly contributing to our positive animal handling initiative. More recently, Emily was awarded one of the 2018 Outstanding Agricultural Mentor Awards. This award is coordinated by Minnesota District 11 Agri-Women and presented at the Women in Agriculture Leadership Conference. The Outstanding Agricultural Mentor Award is in its sixteenth year and recognizes people who have been positive mentors and role models for other individuals, especially women, in agricultural fields. Emily graciously shared her research project with us to help us all better understand communication preferences and strategies for dairy farms. In the spring of 2015, I returned to the University of Minnesota to pursue a Master’s degree in Agricultural Education; I had already earned a Bachelor’s in Animal Science. With my work as an Extension Educator, I wanted to learn more about effective teaching strategies and how to adjust my teaching to various learning styles. I also hoped I could find a project for my Master’s paper that would allow me to further explore a topic I was interested in. Perhaps it was fate, maybe it was just dumb luck; shortly after beginning my graduate work, my advisor Dr. Rebecca Swenson had an opportunity to work on a new project. It was a pilot project funded by UMASH looking at communication strategies on engaging agricultural audiences. Specifically, it would look at engaging dairy farmers with messages about safety topics. It was perfect; working with dairy farmers is a large component of my job, and I have always had a personal and professional passion for farm safety. I was able to join Dr. Swenson on the project as a graduate research assistant and use part of that research for my final integrating paper (a requirement to finishing my degree). The pilot project had two major components, and I worked with the first phase. In this part, the priorities were 1) learning farmers’ beliefs and attitudes on farm safety topics and 2) their preferred channels of communication. These values get at the core of what’s important to farmers; it is valuable insight into how communicators and educators can connect with and appeal to them and their needs. Overarching themes include the farmer as the caretaker and protector of the farm and its employees. Language – many farms employ non-native English speakers, and communicating can be difficult for both sides. Time and apathy – it appears this apathy stemmed from a lack of time to learn about it and work on it as well as a belief that they understood farm safety well enough and didn’t need additional training on it. Terminology – specifically, the term “stockmanship.” We found that most farmers didn’t know or use this word. Turnover – many farmers commented on employees coming to their farms with previous experience that included bad habits. They expressed a need for consistently and efficiently training their workforce. The research also revealed key findings related to preferred channels of communication. Farmers most often seek out publications like agricultural magazines and newspapers for information. They also rely on in-person events like workshops, tours, and one-on-one meetings. Key influencers that were identified include Extension professionals, veterinarians, nutritionists, consultants, field representatives, and lenders, among others. The research also found that farmers maintain strong lines of communication with other farmers. Information is often shared between them via word of mouth, one-on-one conversations, and social media. On the survey, several respondents said they would talk with friends and family about farm safety. The dairy farmers surveyed were also receptive to video formats of messages and are likely to leverage electronic communication channels. Many respondents said they would read or watch content about farm safety. The majority of respondents said they would share content about farm safety and click on links about farm safety. When asked about online learning tools, many respondents had participated in a webinar and some had viewed pre-recorded videos. When asked how they would like to receive videos about farm safety, many respondents said some online format such as email or YouTube and/or a portable device such as a DVD, CD, or USB jump drive. Key influencers that were identified include Extension professionals, veterinarians, nutritionists, consultants, field representatives, and lenders, among others. The research also found that farmers maintain strong lines of communication with other farmers. The findings from this research led to some key recommendations for agricultural communicators, farm influencers, and farmers. Using a model that positions the farmer as the expert addresses several key values/moral norms and barriers. It appeals to farmers’ confidence in their own expertise and desire to protect their employees and be a teacher for them. It also could reduce apathy and save time for many farmers. Using train the trainer is also a great way to ensure the farmers themselves receive adequate and relevant information. Interpersonal communication plays a huge role in farmer education. Leveraging the influence of agricultural professionals as champions of farm safety could lead to big impacts on farms. Professionals can be leveraged by supplying them with training on farm safety as well as resources and materials on farm safety topics for them to share with farmers. Communicators and influencers can also encourage farmers to utilize word of mouth (WOM) communication. Farmer-to-farmer contact is a strong communication channel. It makes sense, as no one understands the values and challenges of farmers better than their peers. This recommendation addresses farmers’ pride and confidence in their abilities and their desire to protect their investment and business interests. A final recommendation from the research was to leverage videos as a resource. Using videos as a resource for farmers can address several areas. It gives them access to an on-demand resource. Videos also integrate well into a train the trainer model, where they can be provided to producers at the completion of training for use on their own farms. Videos can also be supplemented with supporting materials like handouts and posters. A lack of time to attend meetings or trainings supports the idea of videos and accompanying materials being delivered directly to producers. Having videos available on a storage device as well as online would be beneficial to farmers they are easy to access and share with others. This research helped identify themes in communicating with farmers about farm safety topics. The ultimate goal is to work in partnership with farmers, influencers, and communicators to champion a safer farm. It was a great experience to work on this research and dive deeper into a topic I care so much about. Thank you to UMASH and Dr. Swenson for this opportunity!